Call 1 (800) 348-4398 for Special Offers! 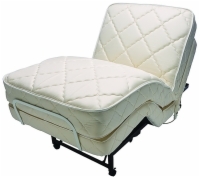 Electric Wheelchairs 101 offers the highest quality adjustable beds from Flex-A-Bed. An adjustable bed helps position your body so that the bed fits the natural curvature of your spine while sleeping. Most people don't think about posture while sleeping, while it is one of the most crucial elements of receiving a great night's sleep. While evenly distributing pressure and reducing muscle tension, your body can fully relax, giving you the most restful possible sleep you can get! If you suffer from neck and back pain, acid reflux, arthritis, limited joint mobility, heart problems, breathing problems, or just minor aches and pains, an adjustable bed will be perfect for relieving your symptoms. Here, you will find incredible deals on adjustable beds! The Value Flex-A-Bed is available in three levels of firmness, all available at the same great low price! These are top of the line adjustable beds and our most popular. The Flex-A-Bed can be adjusted to fit your body and take the strain off the back muscles, which allows for more restful sleep. Offered in all sizes and covered by a 15 year warranty. 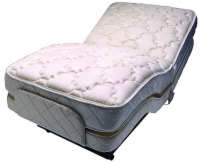 The Deluxe Hi/Low Flex-A-Bed is a motorized adjustable bed. In addition to the fully adjustable foot and head, you can raise and lower the entire bed to ease transfer in and out of wheelchairs, or just to reduce your step height for safety purposes. If you're considering a hospital bed for its functionality, this is the bed for you. 5 Year warranty included with purchase.